But who would have thought that he would get here! 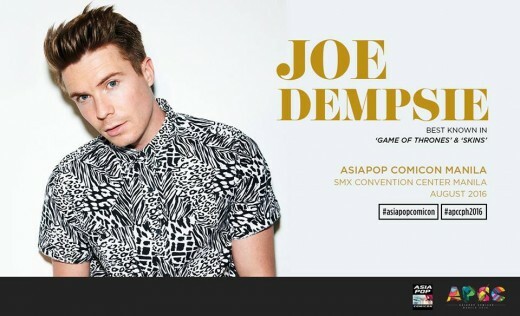 Joe Dempsie aka Gendry of the HBO hit series Game of Thrones (GoT) is coming to town for APCC Manila 2016, the biggest pop culture convention slated on August 26 to 28 at the SMX Convention Center in Pasay City. Other than his role in GoT, Joe Dempsie also starred in Skins and various British television shows such as Peak Practice, Doctors, Sweet Medicine, and The Fades, among others. He appeared in the films One for the Road, Heartlands, and Monsters: Dark Continent. For the fans of Dempsie, APCC Manila is offering Autograph, Photograph & M&G session tickets with the actor, which will be available soon for purchase on SM Tickets website, or at all SM Tickets outlets. Autograph, Photograph & M&G tickets will also be available for purchase on event days. APCC Manila 2016 tickets are now available via SM Tickets with ticket prices PhP550 (one-day pass), PhP850 (two-day pass), and PhP1,050 (three-day pass). Yuri is magnanimously juggling between two managerial jobs: A technical manager position for an advertising/copy-writing company, and an associate editorial position for a fashion and lifestyle magazine. Nevertheless, he still finds time taking photos and seeking for geek nirvana. There is Something for Everyone at ASIAPOP COMIC CON 2016! APCC 2017: Ray Fisher on Becoming Cyborg for Justice League! RAGNAROK FESTIVAL: Celebrating The Return Of The MMORPG That Started It All! Fans Rock Out With THE GUARDIANS OF THE GALAXY in Exclusive Premiere! DENKI MEGATECH CONVENTION Kicks Off The 2017 Convention Season! Wonder Woman fights Darkseid in the PHILIPPINES?! ROB PRIOR doing Live Art in MANILA! Win a trip to Hong Kong Disneyland with DisneyLife! All The Disney Princesses Together for the First Time!